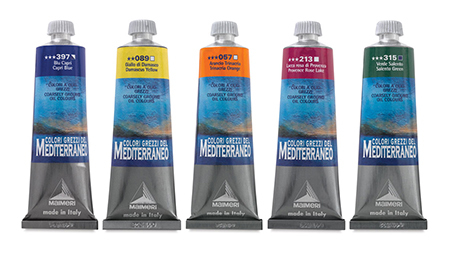 All the brilliant colors of the Mediterranean in one classic line of oil paints! All the brilliant colours of the Mediterranean in one classic line of oil paints! This new chromatic assortment of coarsely-ground Mediterraneo oil colours from Maimeri is basic, pure and fundamental: the colours in this line are calibrated to capture every nuance and modulation needed for sunny, luminous and natural painting. This is a colour range especially suited to painting with warm, bright and harmonious hues, juxtaposed with one another. Mediterraneo Oil Colours are also ideal for plein air paintings of sun-drenched landscapes, warm or temperate climes, or paintings with sunny tonalities and enveloping light. The grain size of these colours is larger than for other oil paints and the paste density is thicker, for accentuated brush strokes. The colour, when dry on the canvas, has a matte finish which dampens light rays and softens tones, giving the surface a rugged feel. Maimeri Mediterraneo Oil Colours are fully mixable with other lines of oil paint.